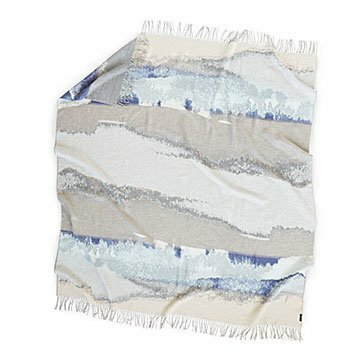 This stunning, cashmere-soft acrylic throw wraps you in coziness with washes of sky and cloud colors. The essence of serene comfort: a rainy day with a book, your favorite tea, and a soft blanket. With its stunning, woven-in washes of cloud and sky shades, this super-soft throw envelops you in that peaceful, cozy bubble even when the forecast is precipitation-free. Made of a German-designed high-nap fabric that rivals cashmere for softness, this high-style snuggler wards off wintry drafts while welcoming the Nap God. Made in Germany. Beautiful blanket! Looks so great in my room! Looks great as a throw on my bed. For lounging or napping on the couch or draped over a chair for looks.